Now is the time to watch for Mountain Pine Beetles! 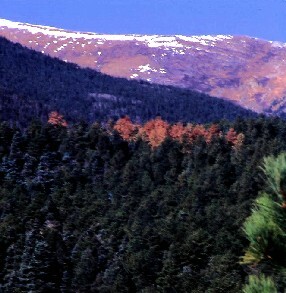 Infested pine trees will begin to fade and turn yellow or brown. Greenleaf can remove and treat these beetle-trees. Beetles fly to new trees between mid-July and mid-September, so you need to act quickly to stop them from spreading! If you have property in Custer County, call us and we will come out and inspect your trees for free. Are trees dying on your property? The problem could be mountain pine beetles. The problem affects Ponderosa pine. If left unchecked, beetles spread into new trees each year, and timely control is of extreme importance. Between July 15th and September 15th the beetles bore out of the trunk and fly to neighboring trees up to one mile away. The beetles usually swarm, resulting in groups of trees being attacked. Beetles often attack trees already stressed by mistletoe, another fatal parasite. They then bore into the trees and lay their eggs underneath the bark. The larvae use the trees� nutrients during winter to grow and develop. The following June, the tree foliage begins to fade and turn yellow, while the beetles are still in the bark completing their maturity. Control measures include cutting the trees and removing them from the property or treating them on-site by enclosing them in 6mm polyethylene plastic. This heats up the beetles and causes molding of the wood which leads to their starvation. A chemical spray called Sevin can also be applied preventatively before beetles attack trees. A variety of other chemicals that have been used in the past have been discontinued due to health risks. Many private forestry companies specialize in beetle control. Landowners may also get information from the State Extension Service and the State Forest Service. Greenleaf suggests property inspections be done in the fall and control measures scheduled for the winter or spring depending on the extent of the problem. In the Wet Mountain Valley area of Colorado, where Greenleaf is located, some speculate that warming trends favor a beetle epidemic. The nearby Salida and Buena Vista areas have been experiencing a significant problem and an epidemic in the Buena Vista area has been raising fears of an outbreak like 1981�s. Len Lankford, Greenleaf's President, says, �We in Custer County have a chance to stop the beetle through immediate control while the populations are low.